Clamps onto surfaces up to 2.5"
Sick of digging under your desk or bed looking for somewhere to plug in your stuff? So were we. That's why we built this clamping power strip with surge protection to help conveniently power up to 9 devices at once. Don't go down undah! Charging station clamps onto any surface up to 2.5" thick for struggle-free plugging. 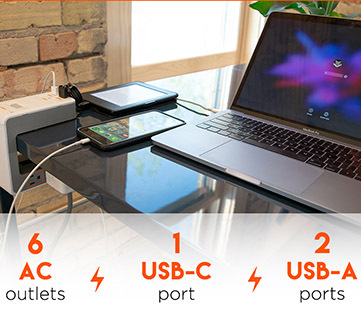 Fill 'er up: With 3 USB ports and 6 AC outlets, you'll probably run out of gadgets to plug in. (Time to buy more!) Includes 1 USB-C port and 2 standard USB-A ports. You've got options: Desk edge? Cubicle wall? Headboard? Universal clamp design holds on tight wherever you need power. Protect your portables! 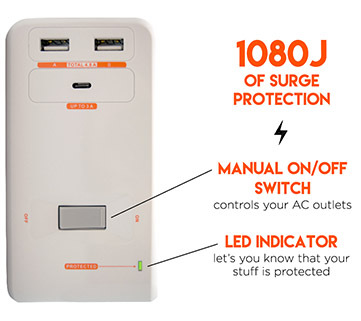 UL-certified, 1080 joule surge protected outlets prevent power overload and failures. 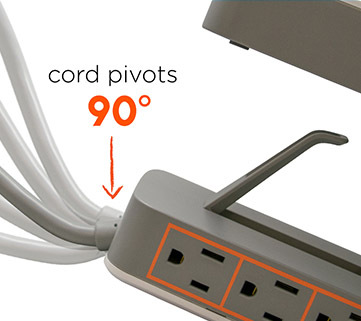 6' power cord goes the distance… to the nearest wall outlet, plus it pivots 90 degrees to make your life even easier. Stop digging under your desk to plug stuff in! We've all been there before: You roll up to your desk at 7am the morning after one too many beverages the night before. Laptop’s outta’ juice, and you need to plug it in, STAT. You get down on your hands and knees, feeling blindly for the outlet, only to find yourself on a one-way train to strugglesville. Spiderwebs in your hair, a nauseating whiff of that piece of egg salad sandwich you dropped 2 weeks ago – it’s the WORST. Just when you thought things couldn’t possibly get any worse… BAM! Noggin, meet desk. Ow. Lucky for you, it doesn’t have to be this way. 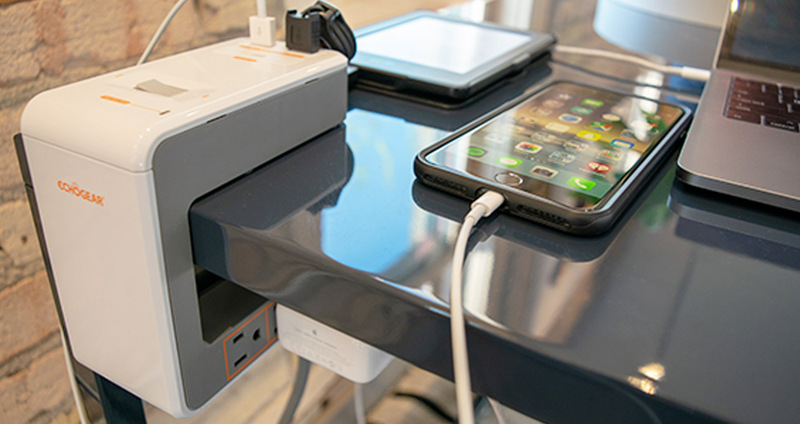 This slick, clamp-on power strip hangs on tight to your desktop, giving you easy, struggle-free access to 6 AC ports, 2 standard USB ports, and 1 USB-C port all from the comfort and safety of your desk chair. In fact, it’ll clamp onto anything up to 2.5" thick: Headboard? Check. Cube wall? Check. End-table? Checkity-check, check. The possibilities are nearly endless. Worried about length? A lot of people are. But there's no problem here: The flexible 6ft power cord will reach anywhere you need it to go. (Ok, ok – within 6ft. Duh.) It even pivots 90-degrees to help you keep the cord safely tucked away. Obviously we don't want a repeat of the Great Cord Tripping Incident of '03. As always with Echogear, you’ll get access to our killer customer support team. They’re available to chat it out with you 7 days a week. For real. Ok. If you’ve read this far, you owe yo-self a treat. Pick up this desk clamping power strip today. Click the button below to add the Desk Clamp Power Station With Surge Protection to your wish list.